April 20 & 21 at 7:00 p.m.
April 22 at 2:00 p.m. Box office opens 1 hour before showtime. 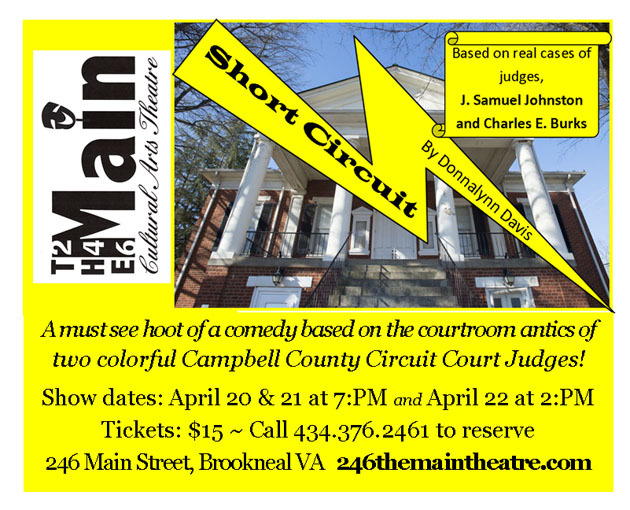 Written by local playwright, Donnalynn Davis, about two retired Campbell County Circuit Court Judges, this comedy meshes the courtroom antics of both into one hilarious romp! Credit card payment only available on LynchburgTickets.com. Lobby and box office will open 1 hour prior to showtime. Please note that all tickets will be held at Will Call for pick up at the door. Please call 434-376-2461 for more information.